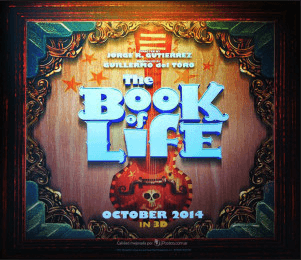 “The Book of Life” is an animated fantasy directed by Jorge Gutierrez, currently playing at the Carmike Cinema 5. Longtime readers will recall that this is my first column. What little I’d heard about “The Book of Life” was promising enough, as both critics and audiences alike seemed to agree that it was a movie. However, a single glance at the concession stand suggested that Jorge Gutierrez was phoning this one in. The popcorn was insufficiently yellow and the soda straws were flexible to a fault. The hot dogs, while palatable, were inappropriate for a PG audience due to their vulgar shape. But with no ingestible alternative, I ordered a single hot dog sotto voce while insisting that it be wrapped in a discrete brown paper bag. I took comfort knowing that I’d be eating this obscenity in the dark, shielded from the gaze of leering deviants and judgmental prudes alike. With my writing accoutrements in tow (including my pleasantly loud typewriter that would drown out the din of mouth-breathing patrons), I entered the theater in grand style and made a beeline for the front row. This allowed me to focus all of my attention on the film’s bottom-left corner, which most critics pathologically ignore. Finally, “The Book of Life” began. But knowing that the first hour of any film is contrived, I took this opportunity to pay a warm visit to the water closet, where I doffed my sweatpants and began the task of relieving myself until the manager informed me that it was more of a janitor’s closet. After a lively tête-à-tête, I was directed to the men’s room where I resumed my efforts in grand style. For the next half hour, I sat in a pleasant (if somewhat contrived) toilet stall while taking in the room’s cacophony of ambient sounds and distinctly human aromas. The entire affair was a wordless testament to man’s inherent need to express himself excrementally. I was moved, for here was art at long last. Voice quivering, I tapped the foot of the gentleman in the adjoining stall and said, “My God, are you paying attention to this?” Alas, my attempt at high-minded conversation was met with stony flatulence. I re-entered the lobby in grand style but suddenly found myself feeling lethargic, no doubt due to the sluggish pacing and wooden dialogue of the film I was missing, so I ordered a tall iced coffee from the concession stand and promptly returned to my seat. When I asked my fellow filmgoers for a comprehensive synopsis of what I’d missed, along with a character analysis and an assessment of the director’s contrived thesis, they responded with profanity-laden abuse, and it became clear to me that “The Book of Life” attracted an audience that was openly hostile to the recently-sat-down. I vowed to rise above their jeering while praying that their lives would end in despair. I was immediately rushed to the hospital where I received a medically-unnecessary skin graft. There’s an old saying in Hollywood; indeed, there are probably a great many more. Regardless, despite its glaring faults, “The Book of Life” managed to redeem itself in the final reel, as I was now the proud owner of a genital-free crotch.